Curl-A-Dog cooks a better tasting hot dog every time and is perfect for family dinners, BBQ, tailgating, and more. Curl-A-Dog cooks gourmet tasting hot dogs that will leave your mouth watering. The flavor pockets hold condiments for maximum flavor and the curly edges char for more grilled flavor, creating the perfect hot dog. 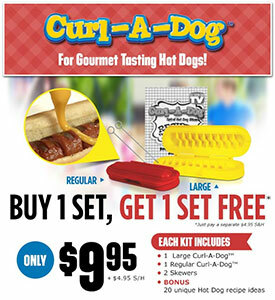 Curl-A-Dog cooks hot dogs through and through and is the simple way to make spiral shaped hot dogs.